Xiaomi has partnered with Faysal Bank to bring its flagship products at your doorstep. Faysal Bank is offering Xiaomi products at installments with 0% markup. Which means that you will be able to buy these top-notch products on installments without paying any interest rate to Faysal Bank, at least in cases where you payback in less than 6 months. 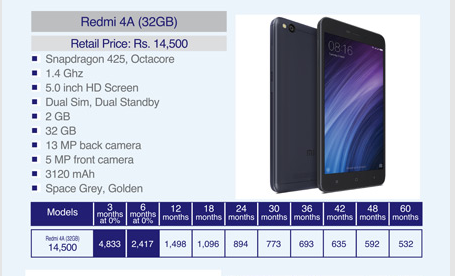 You can buy Xiaomi Mi devices on 3,6,12 and 60-month installments plans. The bank claims that there are no hidden processing fees, you can pre-order and book your desired device with Faysal Bank credit card at no markup at all for up to 12 months. There are four installment plans available at the moment. 3 and 6-month installment plans don’t charge any interest – literally 0% markup. If you go for 12 to 60 month installment plans, you will be charged a 2% markup per month during this tenure. You would have to follow these simple steps to get going. Place an order for the product you want by calling Faysal Bank. Get your product with free delivery. Your order will arrive within first 15 working days from the day of your order. The deal doesn’t stop here, you can also buy these accessories in combo-deals. This is surely a great move to make Xiaomi devices available for everyone. Just like with every other offer involving banks, you have to go through the terms and conditions to make sure you are aware of your rights and responsibilities. Kia matlab? Smj nii ska app ke baat? Jinke pas credit card hai wo installments k baghair bhi le sakte hain. Prices are higher than in Market. Markup to pehle e he.